Bios Life™ – How To Lower Cholesterol and Lower Triglycerides! Bios Life – A new revolutionary patented fiber drink that is clinically proven to lower cholesterol. Bios Life is designed to lower my cholesterol in 4 distinct ways and possibly lowers the risk of heart attacks*. Chromate® is a registered trademark of Interhealth N.I. Nearly every adult is concerned with maintaining good heart health. According to the American Heart Association, Cardio Vascular Disease (CVD) is the leading cause of death, and one in three adults will die from CVD. Cholesterol reduction is considered a primary target to reduce the risk for coronary heart disease. A wide selection of pharmaceuticals are available to reach this goal, the most popular being statins. There is a growing awareness of possible negative side effects of pharmaceuticals, and of statins in particular. Therefore, the public is shifting towards more natural approaches like seeking cholesterol supplements to lower cholesterol. In a recent study, Bios Life was proven to lower the LDL for participants with high LDL levels by 31%. Overall reductions, including participants with fair or better LDL levels averaged over 20%. Additionally, the average increase of HDL in those participants with low HDL levels was 29%. Average increase, including those with normal HDL levels, was 25%. Clinically proven to lower LDL cholesterol, while increasing HDL cholesterol, Bios Life is quickly becoming the standard in the fight against harmful cholesterol levels. Often, over a period of time, people taking statins discover that their cholesterol remains at a level higher than they (and their doctors) were hoping to reach. Hope is now available. Recent clinical studies have shown that when taking statins in combination with Bios Life, the “statin floor” is broken and cholesterol levels are reduced by an additional 20%. Talk to your doctor about Bios Life before use if you are taking any cholesterol-lowering medication. Foods containing at least .65 grams per day of plant sterol esters, eaten twice a day with meals for a total daily intake of 1.3 grams may reduce the risk of heart disease. 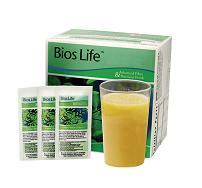 One serving of Bios Life contains 0.67 grams of plant sterols. Cholesterol is a waxy substance found in the bloodstream and in all your body’s cells. It’s normal to have cholesterol, and cholesterol is an important part of a healthy body because it’s used to build new cells, insulate nerves, and produce hormones. One type of cholesterol is low-density lipoprotein or LDL. High levels of LDL (bad cholesterol) increase the risk of cardiovascular disease. The American Heart Association states that when too much LDL cholesterol circulates in the blood, it can slowly build up in the inner walls of the arteries that feed the heart and brain. LDL cholesterol can form plaque, a thick, hard deposit that can clog those arteries. The other type of cholesterol is high-density lipoprotein or HDL. Your body makes HDL cholesterol (good cholesterol) for your protection. Studies show that high levels of HDL cholesterol reduce your risk of cardiovascular disease. Fibers, in particular of the soluble kind, are well known to reduce LDL-c. [1-16] The American Heart Association therefore advises to include 25 –30 grams of fiber daily in the diet. The mechanism of cholesterol reduction by fiber is through bile-acid sequestration. Typically, fiber is mixed with water, and consumed just before a meal. The gel matrix formed in the digestive tract absorbs bile acids, so that cholesterol re-absorption in the blood is inhibited. The cholesterol reducing effect of fibers has been documented extensively in the literature. The sponsor of this study, Unicity International, has marketed a patented fiber drink (BiosLife 2) that works through bile-acid sequestration. This flower extract has been linked by internal research to enhancement of cholesterol metabolism. The plant has been used for centuries in the Chinese culture as a tea. Bios Life is protected by U.S. Patents 6,933,291, 4,883,788, 4,824,672. U.S. and international patents pending. Q: How do I know if I have high cholesterol? A: Your cholesterol levels are measured by a simple blood test. A small sample of your blood is analyzed to determine the total cholesterol level, the level of LDL cholesterol, the level of HDL cholesterol, the level of triglycerides, and the ratio of total cholesterol to HDL cholesterol. Even if you don’t currently have a problem with cholesterol, Bios Life may help to prevent future problems. Q: How much Fiber is in Bios Life? A: The product combines 2.7 grams of soluble fiber with 0.3 grams of insoluble fiber. The product further contains vitamins and minerals, such as chromium. Upon consumption of three packets a day, the fiber amount fills the gap between actual dietary consumption of fiber and the advice of the American Heart Association. Q: I noticed that Bios Life is sweetened with Sucralose. What is Sucralose and is it safe? A: Sucralose, a low-calorie sweetener, is the sweetening ingredient used worldwide in more than 4,000 food, beverage and nutritional products. The safety of sucralose has been confirmed by leading medical, scientific, and regulatory authorities around the world including; the US Food and Drug Administration (FDA), the Joint (Food and Agriculture Organization/World Health Organization) Expert Committee on Food Additives, European Commission’s Scientific Committee on Food, Health Canada, and Food Standards Australia/New Zealand. For more information about Sucralose visit, www.sucralose.org. Q: Many pharmeuctial drugs produce potenially dangerous side effects. Are there any adverse side effects associated with Bios Life? A: Bios Life 2 and Bios Life have been clinically tested on numerous occasions. No adverse side effects were ever reported or measured in test participants. For more information and studies on Bios Life, cick on our doctors only webpage.